ALL SALES TAXES ARE INCLUDED IN PRICE. Personal feedback sent to me on messages not included in feedback on my shop. "Marlene ALWAYS handcrafts the most gorgeous items! She is also extremely reliable and very willing to fix any problem. I love my new necklace!" Marlene Vidibor's Etsy shop wildbraidart focuses on her artwork in all media and specifically her complexly beaded pieces, couture styled and reconstructed designer jewelry, and fiber and paper art accessories. For pictures of Marlene's watercolor collages and fiber pieces please visit her website http://wildbraidart.com or her Facebook page https://www.facebook.com/album.php?id=116041095100245&aid=28310 where pictures of her beaded 3 dimensional beaded coral reef (in progress) can also be found Check her links for other items. Marlene's work is born of the many combinations she sees in designing from the materials she has at hand. Frequently buying materials out of purely aesthetic considerations she then formulates designs mentally, sometimes sketching a preliminary idea before sitting down to work with the gemstones, pearls, crystals, glass, metal beads and or fiber to execute the construction which may be accomplished quickly or take a protracted period of time. The images in the banner above are cases in point of her usual design tactics. The larger image which is a detail of a wall hanging called Desert Winds came to the artist from the colors which are crocheted around spiral pieces which always start her fiber pieces and often her jewelry as well. The hanging which is in private collection, has shells and other found items attached to it. The shells are a reference to the fact that deserts are now what used to be seas. 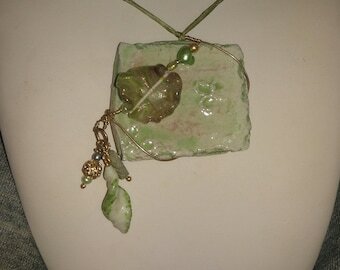 The smaller piece is for sale in this shop and is called Fantasy Garden Necklace. it is made of beads woven in the same fashion as the larger wall hanging and other wall hangings shown on the site. Customers frequently present Marlene with charms and trinkets they've collected over the years to construct new jewelry pieces for them. One such buyer gave her enough pieces to construct 7 necklaces which she wears on a rotation basis and will be a planned inheritance for her children and sisters. 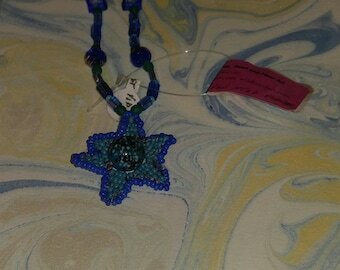 These necklaces included one with Mexican mask pins and other silver jewelry from a beloved aunt; farm and other animals; girl scout and other memorabilia from childhood and one necklace made of all the customers relgious charms from her girlhood times. These necklaces are shown on Marlene's website: wildbraidart.com. 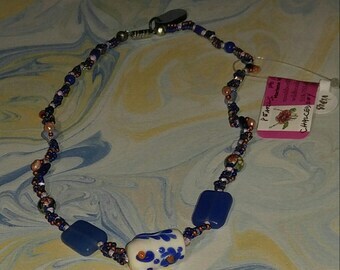 Please feel free to contact Marlene with requests for information about custom made jewelry. 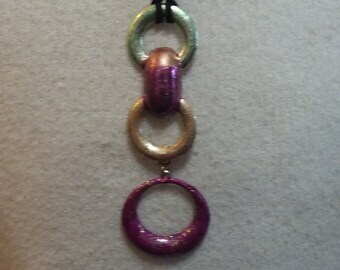 Prices for custom made pieces will generally range from $100-$500 per piece. Simpler pieces may be less expensive. Other items that Marlene specializes in are memory wire necklaces and bracelets with different charm themes also know as story bracelets. From time to time some will show up here in her Etsy store. Beautiful, unique Moon necklace ! A lovely Seller - Marlene answered any question I had, and was great to communicate/work with ! Thank you again ! 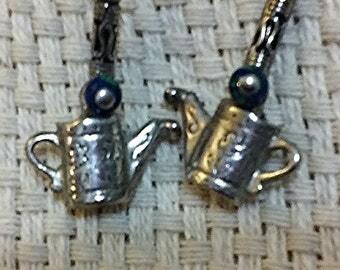 Great Service in a timely fashion... Love the pendants.. Thank you guys oh so much!! really beautiful! i'm very happy with it. No pictures of my studio. However here are some pics of my most recent installation of my beaded coral reef. This installation was at invitation in the Olive Gunnison Natural History Museum in Pawling NY this past fall 2012. This is a close up of my beaded octopus resting among the museum's own fossil corals. My beaded cup coral among beaded sea anemones. I think you can tell in the photos which are my beaded pieces. A closeup of my white tube sponge among other beaded coral reef creatures with colorful fossils surrounding it. All my working life in public administration I also worked in all my spare time as an artist in a variety of media. As my work was accepted and shown more and more I came to take my work more seriously. I did many art and craft shows as members of various guilds, taught courses and started selling in shops. Then one day someone told me about Etsy. I was won over immediately and although it requires a lot of time and effort it is wonderful when people find me and enjoy my work and buy something. Because my works are very unique and not like one another my customer base is still building and I'm still searching for my niche. I would love to get your feedback about my work. I have many many more pieces to post. Keep watching. I especially love making new pieces out of old and am available to make someone something out of your single earring bottoms, broken pins and other spare jewelry. 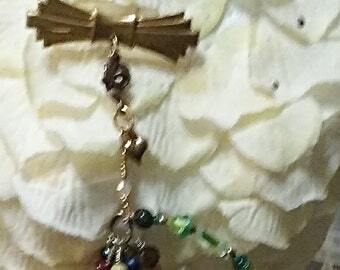 I do collaged pins, necklaces and bracelets. You name it I do it. I'm also available to do repairs of a large variety. Please feel free to contact me for any of your jewelry needs. Owner, Maker, Designer, I'm Camera Shy So Showing My Beaded Coral Reef. I have been designing and making bead, fiber, and paper art all of my life. I've received lots of recognition over the years; museum and gallery shows, awards in both craft and art categories and write ups in magazines and newspapers;love what I do. Thanks for visiting wildbraidart, the home of handmade jewelry, bead, fiber and paper based arts all of which I, Marlene Y. Caller Vidibor, have personally made by myself, (with the exception of recently added vintage items which can be used as jewelry, supplies or equipment.) My philosophy of art is to follow your muse in creating pieces,very often not even following a plan. A note about myself. I am a retired executive who was a practicing artist my entire life. I and my husband are in our 70s and live in a very rural, somewhat isolated area, an both write and practice our arts at home. At times our internet service, phone service, even mail service is irregular and we may not get messages timely. I have only had one instance of that seriously interrupting my business without my knowledge. Unfortunately that customer was quite vindictive without even asking why I had not gotten back to her timely. Although not all customers know how or want to give feedback, it is very important for us sellers to get positive feedback to counteract the buyers out there who may be disgruntled for one reason or another. So please know that I do my truest best to meet my shop obligations and if you message me through Etsy message or convo, rather than personal email which I may miss or may go into my spam, please phone me at my business number which is my cell and where you can reliably leave a message. That number is 518-672-4393. I check that number at least twice a day. As noted above very recently I have begun adding vintage items clearly marked as such. These are items which although in my stash I have not chosen to incorporate into any of my items handmade from altered vintage items which are recycled reconstructions. Among my handmade items you will find unusual free form beading and other art in many varieties. There are no patterns for these and they cannot be reproduced. You will find fiber art both for wear and show designed in similar fashion. As noted above there is a large section of painstakingly designed reconstructions of recycled pieces, mostly vintage in a section of their own called Recycled Reconstructions. These pieces include both bought and found vintage pieces, newer pieces, and beads and wire or other connections woven together in very unique designs. 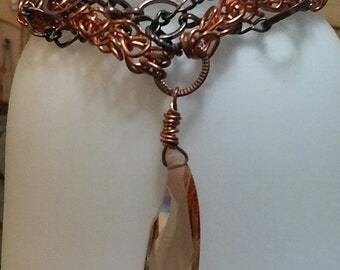 In Crocheted Wire Jewelry you will find delicately crocheted necklaces and bracelets made of fine silver, gold filled,copper, brass and other colored metal wire. 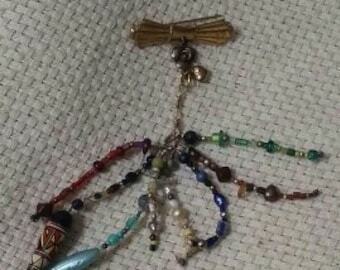 These have beads crocheted into them and various briolettes and found objects attached to them. There are very special necklaces designed from very unusual polished and carved stones and sections of necklaces and bracelets made of precious stones including diamonds, rubies, emeralds, carnelian and amethyst among others and those of religious or ethnic significance. Last but not least are decorative art pieces in both fiber and paper reproductions of my fine art and poetry known as broadsides. These are laminated for protection but can be ordered without lamination as well. If ever you have a question about price or size please convo me. There is frequently room for negotiation. My vintage items are not in a separate section but integrated into the various types of products. 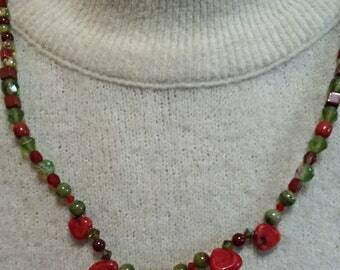 I hope that you enjoy visiting my shop and find something unique to your taste for yourself or a gift for someone for whom you want something special. Due to the nature of these handmade and vintagev items, no refunds are available. You can have a credit or choose another item of the same or greater value. My handmade work carries a full warranty as to quality of construction. I will repair any product free of charge that is deficient when you receive it. Careful maintenance is up to you. Repairs after 3 months will be considered due to wear and tear even if not worn. Just handling and showing off and trying on items can wreak havoc with them if not done carefully. On the other hand, my products are so well made that normal use should not cause any problem. If there is a problem please convo me. i can make repairs at little cost as long as you pay postage both ways. I can accept UPS or FedEx delivery, just can't use it back due to unavailability of facilities and cost of pick up. I accept only paypal. If for some reason you cannot use paypal convo me about procedures for checks or money orders. However be aware that this will greatly lengthen your time of receipt. Under no circumstances will payment other than paypal be accepted for foreign purchases. I will automatically ship 1st class mail for most items. However if you wish another mail method with registration or insurance please convo me as there will be additional charges. I cannot ship UPS or FedEx only USPS. With the huge inventory of items that I have which will be added piece by piece to my shop, I am reluctant to agree to do commissioned items. However, do ask as there may be exceptions like a special strand of beads. Please also visit my other shop wildbraidartvintage while it is still up where you will find a few more fine vintage items that you won't find anywhere else. Unfortunately I find it too time consuming to maintain 2 shops so I will probably shortly be closing the vintage shop. I am still a practicing artist and writer and hope to continue devoting my time. Items which can be used for supplies are also intermingled and tagged as such.